When defensive coordinator Erik Chinander gets in a meeting with the defense, he says it's “Blackshirts against Blackshirts.” It’s not about who’s lining up across from them. They’re battling themselves each day to get better. Through 14 spring practices, the defense stood on top at the end of the day. “There’s been times where we couldn’t move the ball at all this spring,” head coach Scott Frost said after a 24-13 Red win over White in the Huskers’ spring game Saturday. Since Scott Frost’s arrival in Lincoln, the defense has listened to everyone gush over the offense. This season, a renaissance of sorts is expected on that side of the ball. The early enrollees from the new recruiting class are headlined by the offensive skill players. Everyone wants to see freshman wideout Wan’Dale Robinson. Everyone wants to project what quarterback Adrian Martinez is going to look like in Year 2. Everyone asks if that UCF jump can happen here? Meanwhile, the defense has been quietly working. 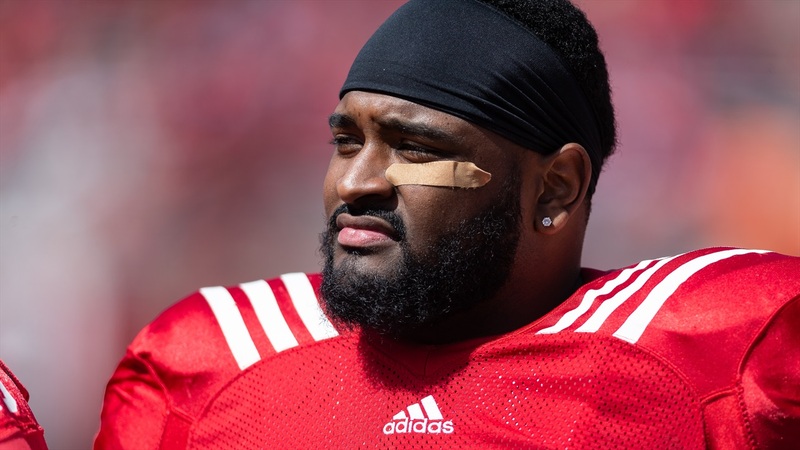 If there was a defensive statement to be made in a scrimmage that featured minimal blitzing, no quarterback contact and a running clock in the fourth quarter, Nebraska’s top players on defense wanted to make it. The red team defense held the white offense to 4.0 yards per play and 3.2 yards per carry Saturday. The ground game produced 81 rushing yards and, if not for a one-handed touch sack by Barry that negated an Alex Davis pick, the white team quarterbacks were picked off twice. “Coach [Tony Tuioti] really emphasized coming out and working hard and making a statement, showing our brand,” said defensive end Casey Rogers. And that brand has changed a little bit since last season. You can thank Oklahoma State graduate transfer Darrion Daniels for that. A fifth-year senior, Daniels has the been-there-done-that vibe down pat. A 6-foot-3, 330-pound nose guard, he has the look of a guy you want to walk off the bus first at road stadiums. But he’s funny, Rogers says. “He’s added so much more light to the d-line room. There’s never a day where we’re not laughing at both of the Daniels.” And with his very next breath, Rogers calls Daniels a wrecking ball. Here’s a guy who has come in and brought his own style to the locker room. He makes fun of his brother, Damion. He tells stories about throwing chicken wings at offensive linemen to get them to stop holding. He hits redshirt freshman center Cam Jurgens with a move he’s never seen before, then meets up with him in the locker room later to teach him how to stop it next time. Inside Memorial Stadium Saturday, surrounded by a sea of red for a glorified practice, Daniels looked around at 85,000 fans in awe. It was, he said, probably the most fans at a game he’s ever played in. He looked at his brother and told him to “ball out and to own it.” Damion said the same back, in a slightly more colorful way. Daniels then went out and did just what he said. The box score credits him with three tackles and half a tackle for loss, but Daniels’ impact was felt. On several plays, he bull-rushed his blocker back into junior quarterback Andrew Bunch’s lap. He stuffed a Jaylin Bradley run at the line of scrimmage after shedding a block. For most of his snaps, he won his battle. “He’s incredibly quick,” Jurgens says. If Nebraska is going to take that next step as a defense in 2019, it’ll be because the Blackshirts are able to more effectively and consistently stop the run. If the Blackshirts are able to do that, Daniels is going to play a huge part. Khalil Davis calls him a natural leader, someone who doesn’t just talk to the rest of the line, but the entire defense. “He gets them going when we’re down,” Davis said. Barry says he’s just as good at opening up plays for others as he is making plays himself. Daniels has the defense playing with confidence. The guys who were a part of last year’s 4-8 team, and the team before that, have motivation to make this season different, sure, but Daniels has absolutely added something to this group. He brings it every day. If guys don’t match his intensity, he fixes that. “I just think we’re a bunch of dogs,” Rogers said of the defense “We’re going to be a lot tougher. I think we realize that last year we weren’t exactly where we wanted to be. I think it’s really important that this year we’ve found that, and we know where we want to be and we can see ourselves progressing to where we want to be.